In Sapiens, historian Yuval Noah Harari recounts the history of Earth’s most dominant species. History began, he asserted, with the cognitive revolution. Homo sapiens learned to tell stories, a talent that enabled the species to spread throughout the Earth and to drive other human species to extinction. This was followed by the agricultural revolution, which gave rise to religion, empires, and money. As empires grew and trade networks expanded, the scientific revolution arose, creating the modern world as we know it. 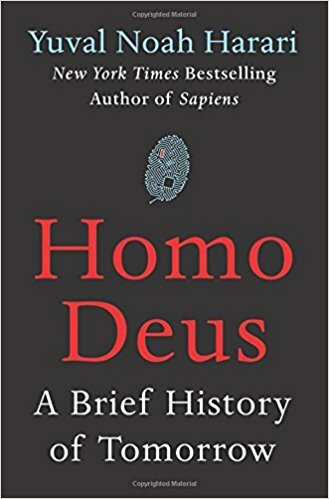 ﻿ But now, in Homo Deus, Harari wonders if the time of sapiens is almost over. For starters, there is an increasing tendency among biologists to look at organisms not as entities but as algorithms. If humans are extremely efficient algorithms, might they not be replaced, as technology marches forward, by better algorithms? As technology automates and replaces more and more jobs done by humans, Harari sees artificial intelligence and enhanced humans as possibly pushing Homo sapiens aside. Some of what Harari predicts is unsettling. Yet he also makes clear this is not prophecy. No one can predict the future with any degree of accuracy. Indeed, predicting the future often causes it to change.